As I've mentioned in other threads, I'm a devotee of the "always go for as much Quality as you can" school of XIV crafting. This is the only way to get a high quality result, of course, but also -- by far -- the cheapest way to level a craft. It's fast leveling, too, because of the huge XP bonuses for adding Quality. In a nutshell: Skills consume two resources--CP & Durability--to fill the Progress bar and add as much Quality as possible before Durability reaches 0. Once the either Progress bar is completely filled or Durability hits 0 the crafting mini-game ends, so any leftover CP or Durability is wasted. Getting the best result from your resources can be a balancing act, and --- because skills can fail and waste CP/Durability -- also a game of brinksmanship. Condition affects how much Quality you can add with a skill. The better the condition (ranging from Poor to Excellent) the more Quality you get. Your crafting level relative to that of the recipe affects skill success. You'll see more skill failures when recipes are higher than your level, and more successes when they are lower. CP adds to your total CP (aka Crafting Points). Your CP pool is refilled for each recipe your craft. Control increases the amount of Quality gained by using a "Touch" skill. Craftsmanship increases the amount of Progress gained by using a "Synth" skill. Finally, just to make the balancing act more fun, there are skills to restore some Durability (at the cost of CP), restore CP (at the cost of Durabilty), increase Success chance (costing both CP and Durability), and lower the level of the recipe (costing both CP and Durability). tl;dr - LOTS of knobs to play with, most are for juggling resources and success in order to craft recipes with as much Quality as possible. Guarantee you'll be able to finish the recipe, even if CP is gone. Guarantee you'll be able add quality, even if CP is gone. Restore CP proportionate to Inner Quiet uses; cancels Inner Quiet. Careful Synthesis and Hasty Touch are practically "must haves" in my book. Between Rumination and Tricks of the Trade, I prefer Rumination. As much as I hate to cancel Inner Quiet, it restores more CP than Tricks of the Trade and makes sense if used late in crafting session. 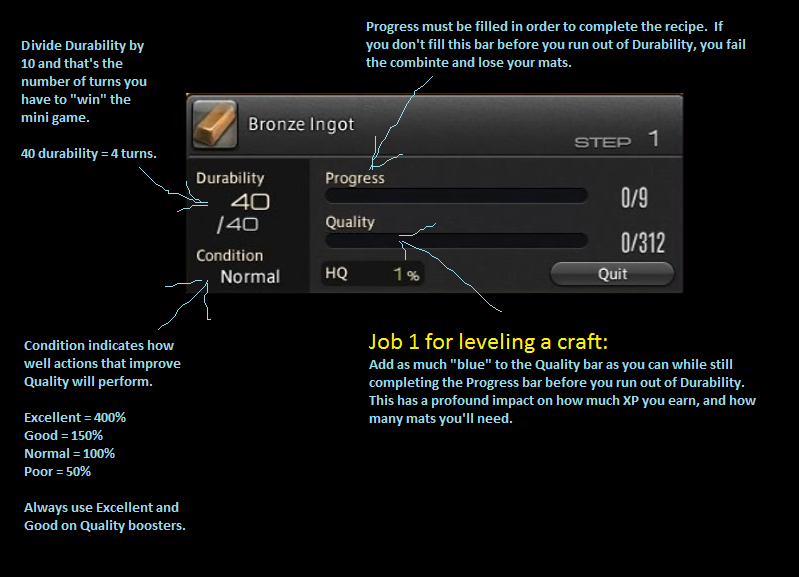 tl:dr - Get a few x-craft skills if you want to maximize quality. Using high-quality materials and components for a recipes is the best way to fill a large portion the quality bar. If you are trying to craft an HQ item, definitely start with HQ mats! From the XP perspective, however, it appears the XP bonus for Quality is based solely on the Quality you add using skills. tl;dr - Use HQ mats to make HQ items, not for XP. 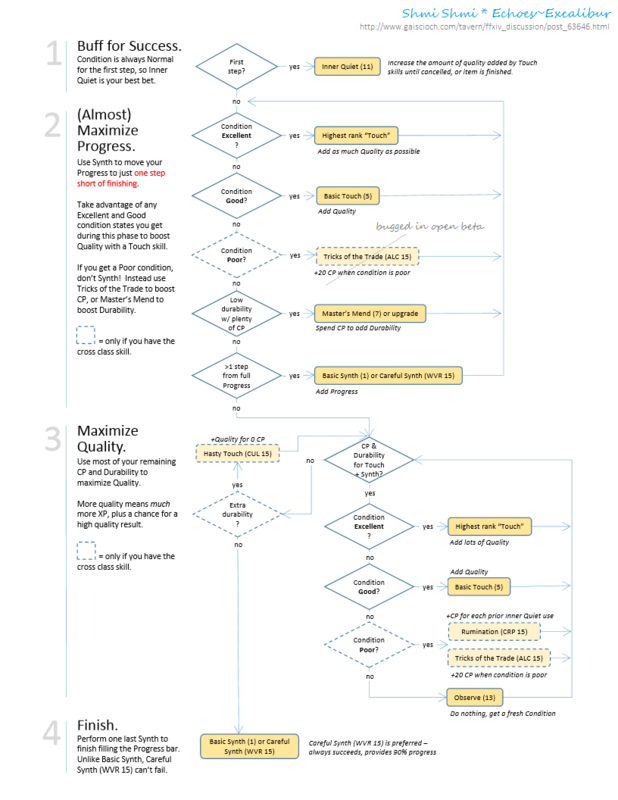 The following flowchart shows my best guess for good approach to maximizing quality from skills. TIP: Don't neglect you stats if you are crafting for quality. Use gear and food with CP, Craftsmanship and especially Control! TIP: Make sure your crafting level is equal or higher than the level of the recipe. This flow assumes you've leveled your first craft to at least 13, when Condition starts to vary from Normal. The cross-class skills are optional, of course, but greatly increase amount of the Quality you can add. tl;dr - Inner Quiet first, always. "Touch" skill on good and excellent. Don't fail to finish! That's my take on Quality, based on what we've learned so far. I'm sure there are some more wrinkles and curlicues to master as we level up, but this should be a good starting point for folks. That is great Shmi, thanks for posting. Are you bored by any chance?!!! | Are you bored by any chance? Thats an awesome char to follow, and a great show on the cross-class skills! Definitely planning on getting a few crafting classes to 20 before I move any past that! Bookmarked! To say this will be useful would be an understatement. Thank you for taking the time to "craft" this guide, Shmi! Thank you so much, Shmi :) I was just beginning to play around with crafting when Phase 4 ended. I do enjoy the crafting system in FFXIV. However, I was really stumped at how to raise the quality more than just a tiny bit. Never would have thought of cross-class abilities. So, thank you, thank you, thank you!! Anyone else counting the minutes til Early Access? The other games I am killin time with are just not cutting it for me LOL. This is awesome. This game has the best crafting system I've ever used.